Context :Carbamate insecticides are widely used in commercial agriculture and home gardening. A serious side effect of organophosphate and carbamate intoxication is the development of acute pancreatitis. Case report: A 36-year-old Caucasian woman was admitted to our hospital with cholinergic crisis and pancreatitis soon after the ingestion of a carbamate insecticide (carbofuran). An abdominal CT scan disclosed pancreatic necrosis with intrapancreatic fluid collection, consistent with the development of a pancreatic pseudocyst in a subsequent CT scan. No predisposing factor for pancreatitis was evident. Pseudocholinesterase levels returned to normal 7 days later and the patient was discharged in good physical condition one month after admission. 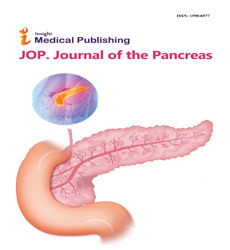 Discussion :Although acute pancreatitis is not infrequent after organophosphate intoxication, it is quite rare after carbamate ingestion and has not been previously reported after carbofuran intoxication..